ASIAN markets buckled yesterday on news that Greeks had voted strongly against austerity measures proposed by the nation's creditors at a referendum on Sunday. The vote could spell its exit from the euro zone and spark further volatility across global capital markets. Investors beat a hasty retreat amid fears the turmoil in Greece might spread. Sentiment on Wall Street had already been downcast on Friday, with the Dow Jones Industrial Average sliding 0.16 per cent. 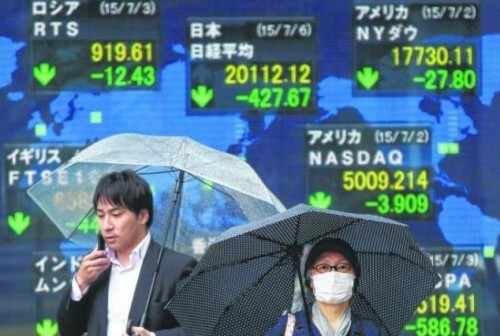 The Nikkei 2255 in Japan slid 2.08 per cent yesterday, while Hong Kong's Hang Seng Index entered correction territory with a 3.18 per cent fall in a heavy sell-off. The Straits Times Index shed 9.79 points, or 0.29 per cent, to close at 3,332.94. Bucking the trend was the Shanghai Stock Exchange Composite Index, which jumped 2.41 per cent on the back of measures designed to boost the market, as Chinese equities on the mainland suffered major losses in recent weeks. China's central bank has stepped up measures to support the ailing market, with initiatives to offer liquidity for margin-trade financing. Still, IG market strategist Bernard Aw noted the global markets have reacted less aggressively to Greece's "No" answer than expected. "Yes, there are some investors flocking to safe-haven assets, such as treasuries, the Japanese yen and the United States dollar. But by and large, the fear has not turned into panic," he said. CMC Markets analyst Nicholas Teo added: "What matters most will be the direction European bourses will lead with later, when they absorb the overnight news." At home, blue-chip losses were led by commodities trader Noble Group, which slumped 3.5 cents to close at 71.5 cents. The company had announced before trading that it will redeem all outstanding 6.625 per cent senior notes due 2020 on Aug 5 this year. The notes were worth US$235 million (S$317 million) as of Friday. "We have redeemed the notes at the earliest opportunity available, reducing interest costs and improving the flexibility of the liabilities side of the balance sheet to reflect our asset-light strategy," said a Noble spokesman. Palm-oil producer Golden Agri-Resources and agribusiness group Wilmar International were also among the day's laggards, dropping 2.41 per cent and 0.91 per cent respectively. Meanwhile, some of the top blue-chip performers included port operator Hutchison Port Holdings, which climbed one cent to 86 cents, as well as telecoms giant Singtel, which rose two cents to $4.27. Offshore services provider Ezra Holdings' rights shares were the most actively traded, with 114.5 million shares changing hands. The shares edged up 2.3 cents to close at seven cents. However, this was at a discount to the issue price of 10.5 cents.